The Lawyers’ Professional Indemnity company is a Toronto-based, professional liability (“E&O”) insurer with a mandate to provide quality insurance services to our insured lawyers. As part of achieving our mandate, we are currently recruiting for a Program Coordinator. 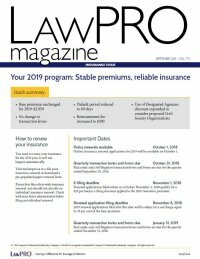 The role of the Program Coordinator is to provide written and verbal information on the insurance program to the members of the legal profession. The information the Program Coordinator provides includes: information concerning insurance coverages for the lawyer, account information on premiums, and information on additional programs such as risk management. The successful candidate will be proficient in English (French is an asset) and will receive intensive training about the program and the Company before answering any calls from the public. There is excellent growth potential in this role to learn more and take greater responsibility for insurance program administration. Have law, underwriting, or insurance related experience, preferred. LAWPRO is committed to providing employment in accordance with the Accessibility for Ontarians with Disabilities Act, 2005. Please be advised that accommodation is available in our recruitment processes to all applicants with disabilities, upon request.